The Big Wobble: State of emergency declared: Peru floods update: Over Half Million Affected: 72,115 displaced: 110,094 homes affected: More rain on the way! State of emergency declared: Peru floods update: Over Half Million Affected: 72,115 displaced: 110,094 homes affected: More rain on the way! Torrential rains triggered flash floods in the Peruvian capital Lima, stranding thousands of people and forcing rescuers to find ways to evacuate them across roads turned to raging rivers. The inundation came as the National Emergency Operations Center said at least 65 people have been killed in Peru this year in natural disasters, the latest being three deaths in a flood in the La Libertad region of northern Peru. After weeks of heavy rain, some residents on the outskirts of the capital of 10 million people awoke Friday to the realization their bedrooms were filling with water. Others found themselves cut off by mudslides that blocked portions of the main highway linking Lima to the center of the country. In one dramatic scene, rescuers used zip lines to help residents of Lima's Huachipa neighborhood escape over the torrent of brown water that was once their street, as it swallowed up cars and trucks. The floods have been triggered by El Nino, a warming of surface temperatures in the Pacific Ocean that wreaks havoc on weather patterns every few years. This year it has hit Peru particularly hard. "It's a difficult situation, there's no doubt about it. But we have the resources" to deal with it, said President Pedro Pablo Kuczynski. The government announced it would release 2.5 billion soles ($760 million) in emergency funds to rebuild affected areas. Around 100,000 people have been affected by the current flood event in Lima Region. On Tuesday 14 March, the rivers Rimac, Huaycoloro and Huaicos all overflowed in different points of the capital affecting Chaclacayo, Lurigancho-Chosica, El Augistino and Punta Hermosa. A bridge dramatically collapsed in Talavera, San Juan de Lurigancho, Lima Province. Elsewhere in Lima region the Supe river overflowed, inundating nearby areas in Ambar District. Authorities report that Mala, Chilca and Cañete have also been affected by flooding. 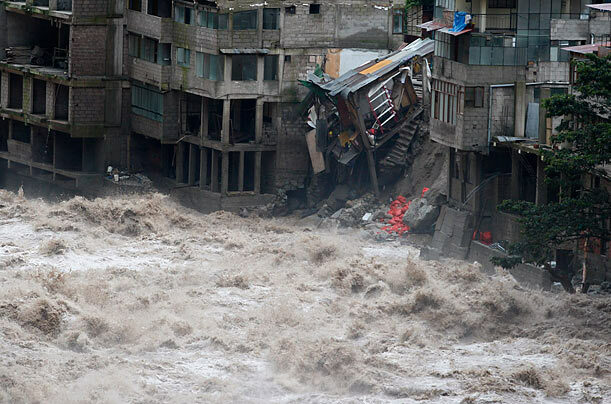 62 people have lost their lives as a result of the heavy rain, flooding and landslides. At least twenty regions have been affected. Wow! I'm so sorry. I wish I had something to send to help...I'll send prayers, it's what I can afford! God Bless and keep you well and safe. Respite soon!